The Heartland Klezmorim will be performing at the Jewish Community Center in Oak Park MI, on September 2 at 2pm. Brand new Jon Madof project, Zion80. It's a 15-piece band playing the music of Rabbi Shlomo Carlebach, with arrangements inspired by the Afrobeat master Fela Anikulapo Kuti. We'll be playing every Monday night this July, August and September at The Stone in New York City. Wow … what can we say. We are excited to have the opportunity to play at such a wonderful venue. Our brand new album The 30th Meridian: From Cairo to St. Petersburg with Love will be fresh off the presses for this show and the following northeast tour. We will be selling our new album for $10 at the show, $5 if you purchase a ticket online with the Regattabar in advance. By all means mark your calendar for this one, folks! What: "KLEZMERANDO" - Klezmer music workshop with Igor Polesitsky, principal violist in "Orchestra del Maggio Musicale Fiorentino" and founder of "Klezmerata Florentina". Where: Quincinetto (Turin - Italy). Our brand new album The 30th Meridian: From Cairo to St. Petersburg with Love will be fresh off the presses for this tour. We will be selling our new album for $10 at the show. The London Klezmer Quartet and other top UK Jewish music acts entertain at the free annual outdoor event in London's Regents Park. Every Sunday Morning, combining live music and food in a fresh, cultural environment, City Winery’s Klezmer brunch series pairs some of the greatest musicians in the world with delicious lox, bagels and other tasty fare on Sunday mornings from 11am to 2pm. 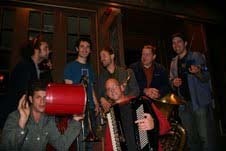 City Winery's brunch on Sep 9, 2012 features new Jewish music from Klezwoods. The band's brand new album The 30th Meridian: From Cairo to St. Petersburg with Love will be fresh off the presses for this tour and they will be selling it for $10 at the show. "I'll be performing some of my latest compositions. After (or possibly before) the concert a documentary film is being shown about my life and music: The film is entitled "Moldavian Blues". The film is by the English film maker Malcolm Hart. Drinks and snacks are available." KCB's violinist Yaeko Miranda Elmaleh, performing with Brandon Seabrook, mandolin/guitar, Michael McLaughlin, accordion, Ehud Ettun, Bass, music from the Jewish, Kezmer, Greek and other world music styles. September 20th 2012. 8 pm. Violinist Zina Schiff and pianist/organist Heinrich Christensen will perform in recital at St. Johns Seminary on Saturday evening, September 22, at 7:30 p.m. The Chapel is at 127 Lake Street in Brighton - the second driveway North from Commonwealth Avenue.